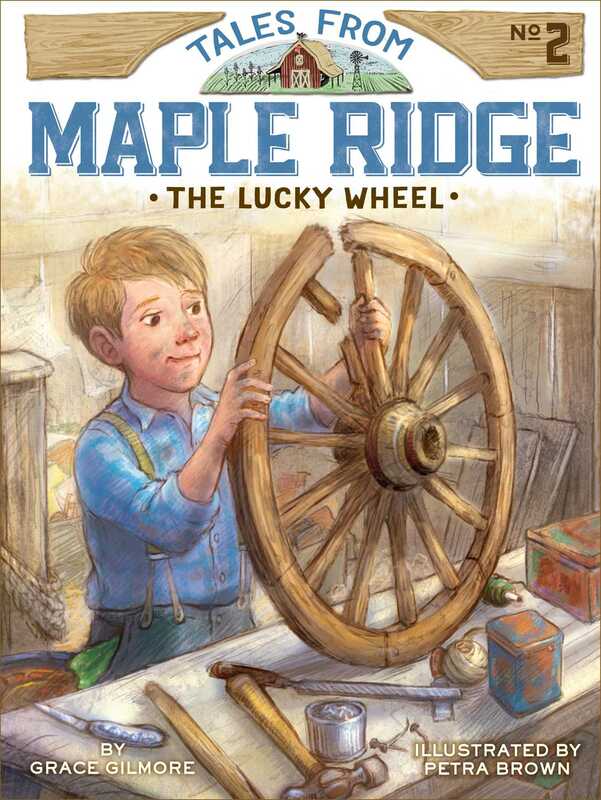 Logan puts his skills to the test to help his town repair the schoolhouse in this second book of a wholesome series that’s like Little House on the Prairie for younger readers. The residents of Maple Ridge are trying to raise money to fix their schoolhouse. Repairs just can’t be put off any longer! Everyone has decided to pitch in and sell their old or unwanted items at a market held outside the nearby city. Logan wants to contribute by fixing and selling a wagon wheel that he found on the side of the road, even though nobody believes he can handle the task. Logan works very hard on the repairs…but will his effort pay off? With easy-to-read language and illustrations on almost every page, the Tales from Maple Ridge chapter books are perfect for beginning readers. It was Monday morning, and Logan Pryce was late for school. He ran through the door, out of breath. His knickers and boots were muddy. The other students were already at their desks. Everyone turned and stared at him, including his sister Tess and his older brother, Drew. Tess mouthed the words, Where were you? “What is a Fix-It Shop?” Miss Ashley asked. “My Fix-It Shop is where I fix old things and invent new things!” Logan said proudly. The children turned in their seats. The boys sat on one side, and the girls sat on the other. The six- and seven-year-olds sat up front near Miss Ashley. Drew, who was eleven, sat in the back with the older kids. Logan, who was eight, and Tess, who was nine, sat in the middle. Usually, there were twenty students present in the one-room schoolhouse. But spring was planting season, so a few of the boys were missing. Farmers usually kept their oldest sons at home to help with the plowing and sowing. Pa used to keep Drew home for this reason. Grace Gilmore is a city girl, but she has always been fascinated by farm life. Growing up, she spent many summers riding horses, chasing chickens, and swimming in the creek at her great-grandparents’ farm in the hollows of Kentucky. When she isn’t writing books, she can be found playing the piano, baking cookies, or wrangling various pets. Grace lives with her family in Ithaca, New York. Petra Brown lives at the foot of Mount Snowdon near the little Ffestiniog railway, in the beautiful country of North Wales, United Kingdom. When she was a child, she used to love to look through books and draw the pictures herself. Now she finds that illustrating children’s books is immensely satisfying. You can visit her at PetraB.co.uk.